This is not the kind of stuff that I want to be spending my time writing about, but I discovered a serious enough practical change to one of my old analyses that I felt it was important to inform you all of it. 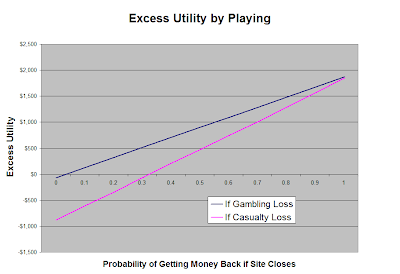 ...For simplicity, we'll assume that any money lost due to site-specific risks [sites closing down or withdrawals being seized] is treated the same as a poker loss and directly deductible against poker winnings, though I believe this is not exactly true. It turns out that this is indeed not exactly true. In fact, being able to deduct this money against poker winnings is probably not possible in many cases. The default classification for such a loss would be as a casualty loss. Even though a player may have been "gambling" on the chance that the site would return his funds, this must be considered a casualty loss rather than a gambling loss, which brings about some serious restrictions in many cases. The effects on the affected player's bottom line are significant. Professional poker players can take such a casualty loss related to his poker business without any limitations. So, if you file as a pro, you can ignore all of this. The original approach is still accurate for anyone filing as a professional on their taxes. Amateur players most likely have to take the loss of poker site funds as a casualty loss, which is a deduction that is strictly limited. 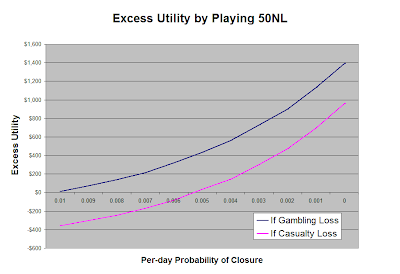 A casualty loss can only be deducted to the extent that it exceeds 10% of adjusted gross income (AGI) — and, remember, while an amateur player still ends up getting to use his net (positive) gambling winnings for his bottom-line taxes, the AGI is a figure which is calculated after all winning sessions are added, but before losing sessions are deducted. Amateur players can only take a casualty loss if it exceeds 10% of their AGI, an amount which will always be artificially inflated above actual income due to session-by-session accounting that amateurs must use. In almost all practical cases, this will mean that losses due to the risks of the current online poker environment will not be deductible at all unless you file as a professional. Bob, a formerly-winning recreational small-stakes player, decides to deposit $500 on a current risky U.S.-facing poker site. Though he knows he will not make much money, he enjoys playing and wants to keep his poker skills in practice. He averages $3/hr in risky site funds by playing on the site, and after playing for several months, he has run his balance up from $500 to $1,500. The site then has its funds seized, declares bankruptcy, or otherwise absconds with the money. Bob was never able to cash out successfully. If Bob's AGI for the year is above $15,000, he cannot deduct any of the $1,500 that he lost. This is almost certainly the case, even if Bob does not suffer from undue AGI inflation from his poker sessions. However, Bob still earned $1,000 in gambling winnings from his play on the site, even though he never got his money. Notice that, given that the site ended up disappearing, Bob would have been better off if he lost money on the site. Winning has increased his taxable income, despite not providing any actual money or deductions to Bob. Effectively losing money by winning at poker on a site that disappears is highly unfortunate, and a pretty big deterrent to playing at all when there is any risk of losing one's online balance to the site-specific risks. I modified the old model by making the losses due to unretrievable funds occur after taxes, rather than before. To keep the charts simple, I considered only the 50NL case this time. See the old article for the other assumptions. We see that, as one might expect, the effects of this tax correction do not change much based on the per-day probability of site closure (i.e. the average lifetime of the site). If the site is likely to die at some point, the hit of this tax situation will be about the same whenever it happens, at least when cashouts are liquid enough along the way. Much more important is the liquidity of the site, which will dictate the probability of funds being lost forever when the site disappears. After all, these funds being lost is what causes this fun little tax situation to occur. 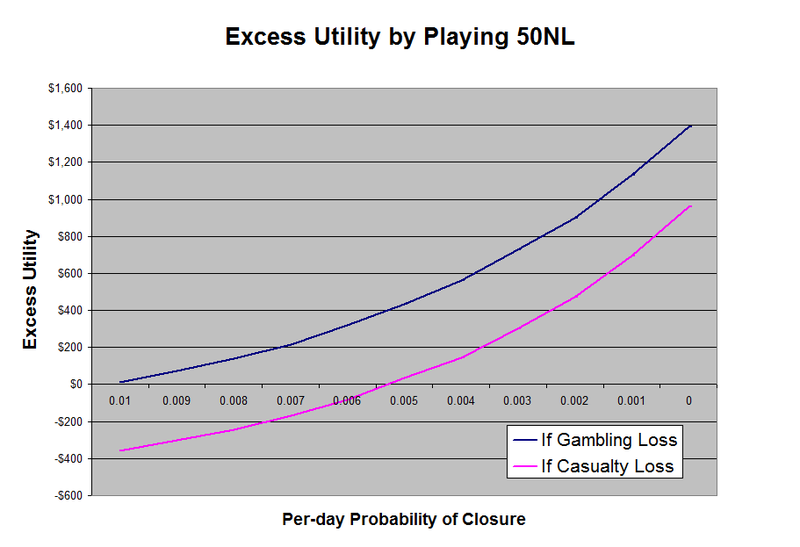 Once the probability of losing funds becomes reasonably high, the utility gained by playing drops off quite a bit. Remember, playing and winning will go on to cost money if the site ends up not paying. Even in the extreme case where there is no probability of the site ever allowing a cashout, the "money" won on that site would still be considered gambling winnings for a player who knowingly put money onto the site for the purposes of practicing his game. What a mess. 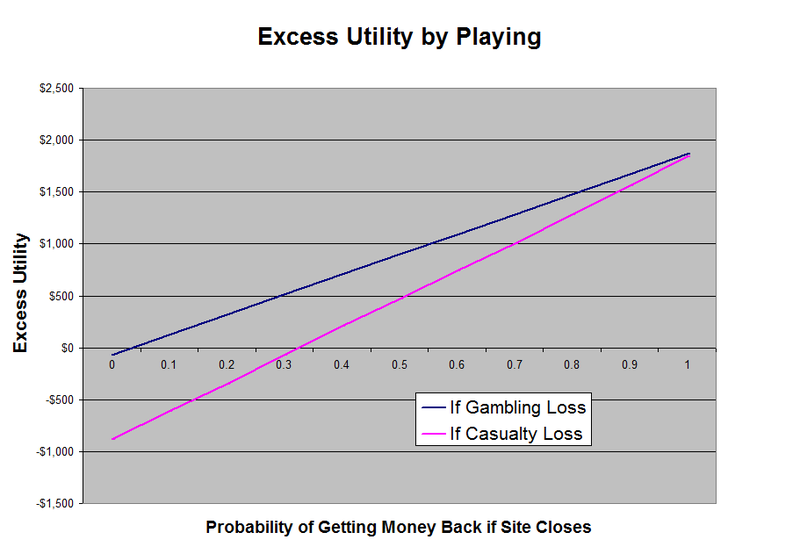 Overall, I would think that any reasonable estimate of the safety of current risky sites is going to involve more than enough risk to really cut into the expected utility of playing. So, if nothing else, this provides another strong incentive to choose even lower stakes than one otherwise might. The less funds that are at risk, and the less likely a player is to win money and go on to get it stolen from him, the less the effects of these negative tax implications will be. Americans who don't file as professionals and who currently have funds stuck on Full Tilt Poker (or, more likely, the other, less-reputable sites) will also suffer negative tax effects if those funds end up not being returned to the players. Unless their online bankrolls were more than 10% of their total income for the year (plus the phantom session-by-session income in the AGI), recreational players will get no deductions at all if their money is absconded with. Strangely, in the event that the funds aren't returned, winning recreational players would have been much better off somehow losing their entire bankrolls prior to April 15. In particular, if Full Tilt Poker goes on to end up not returning U.S. funds, then of the alleged $150 million in American funds that are stuck there, I would guess that at least $50 million of them will be completely non-deductible, even though much of that sum represents taxable poker winnings. It's possible that, at least in the case of money put on post-Black Friday sites knowing that there would be a chance of not being able to get money out, there might be a way to argue that the losses should be gambling losses rather than casualty losses. The key factor here is the notion of constructive receipt, which is the rule which causes poker income to be taxable when it is earned rather than when it is cashed out. The underlying principle is that, as soon as a taxpayer is able to undergo actions to have the money in their hand, that income is immediately taxable. In the case of a poker site that disappears with player funds, one might argue that the player did not actually have the ability to ever receive the money and thus that constructive receipt does not apply. If this approach were deemed to be valid, there would be no taxable income. It is likely important that the funds weren't accessible at the time they were won, rather than just at some later date when the site closed or when a cashout was attempted. For a hypothetical site which has never processed withdrawals, this would be true. For U.S.-facing sites which are currently not processing U.S. withdrawals, perhaps this is true, though the mere possibility of you being able to successfully withdraw in the time after the money was won might be enough to invalidate this. For pre-Black Friday sites, it's definitely less true, as though it certainly had been difficult to withdraw funds prior to Black Friday, people were able to do it with some degree of regularity. It's hard to guess where this line would be drawn. Also, it is difficult to find a way to reconcile this sort of accounting rule with the necessary session-by-session accounting, which implicitly assumes constructive receipt. I find the tax effect described in this article to be quite absurd, even in the context of the other IRS rules that produce various unfair tax situations for poker players. Despite this, there might not be any reasonable way around it. Filing one's taxes as if these losses were gambling losses instead of casualty losses may not be considered appropriate by the IRS, which has a history of interpreting rules for anything related to "gambling" as harshly as they are able to. Fighting to clarify the nature of these losses may be costly. Thanks to taxdood, Russ Fox, and PokerXanadu for helping me understand this tax situation.